Disclosure: This post may contain affiliate links. 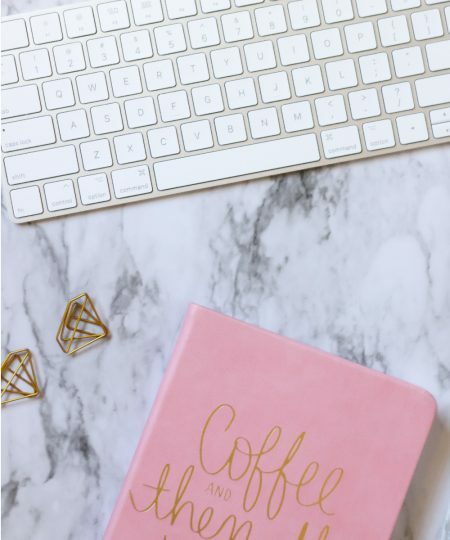 Making a purchase through a link in this post may earn me a small commission at no extra cost or hassle for you. I only link to products I personally use and would recommend to friends and family. For more information on affiliate links, read my disclosure policy. Looking for new brushes to use within Procreate? 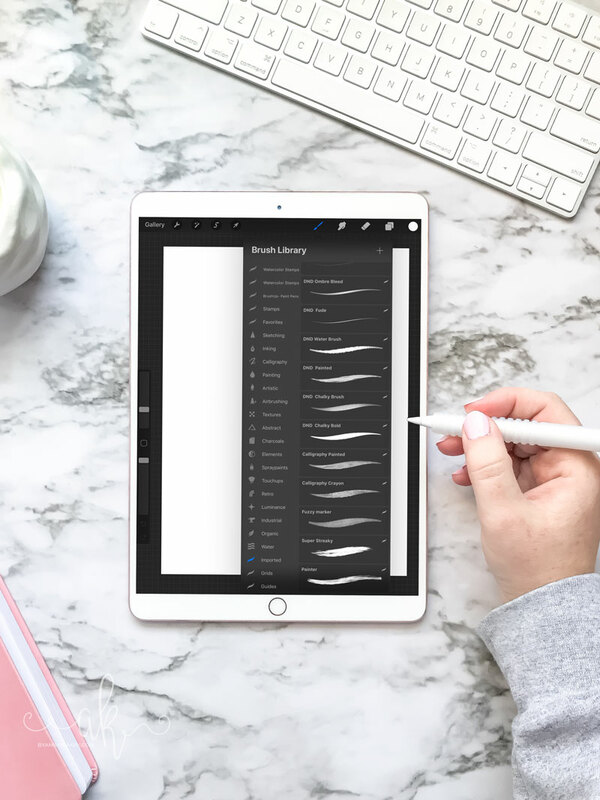 Check out this list of my favorite Procreate brushes both FREE and paid. I have been using Procreate for lettering now for over a year, and it’s probably my favorite way to de-stress and relax. Sure I love picking up an actual brush pen too, but lettering on the iPad is so easy and portable! Since I’ve been using Procreate for so long now for different lettering pieces and for practicing, I’ve definitely accumulate my fair share of brushes. Some I’ve bought from my favorite artists, and others I’ve come across for Free. I’ve even developed a few of my own! 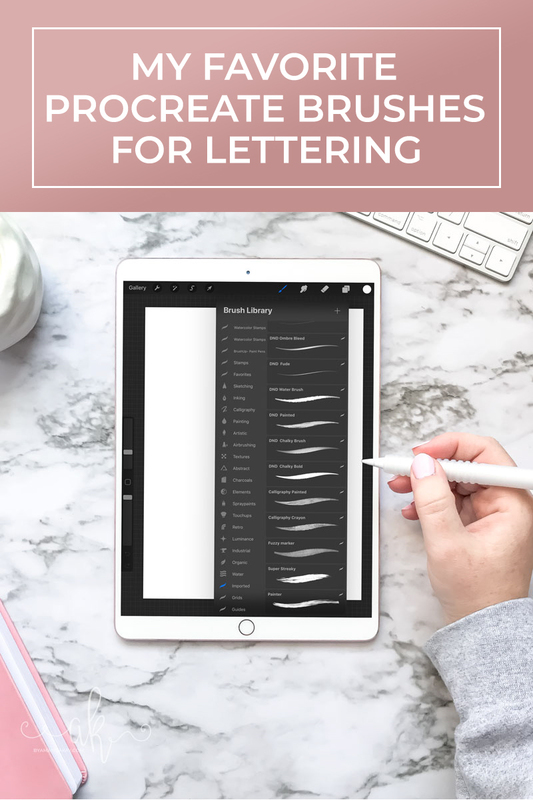 So I’ve compiled a list of some of my favorite Procreate brushes for lettering that I use on a regular basis. Some of them are free and some of them are paid but still very affordable. Check them out below! You may already know this, but Creative Market sends out emails every Monday with 6 new freebies for the week. 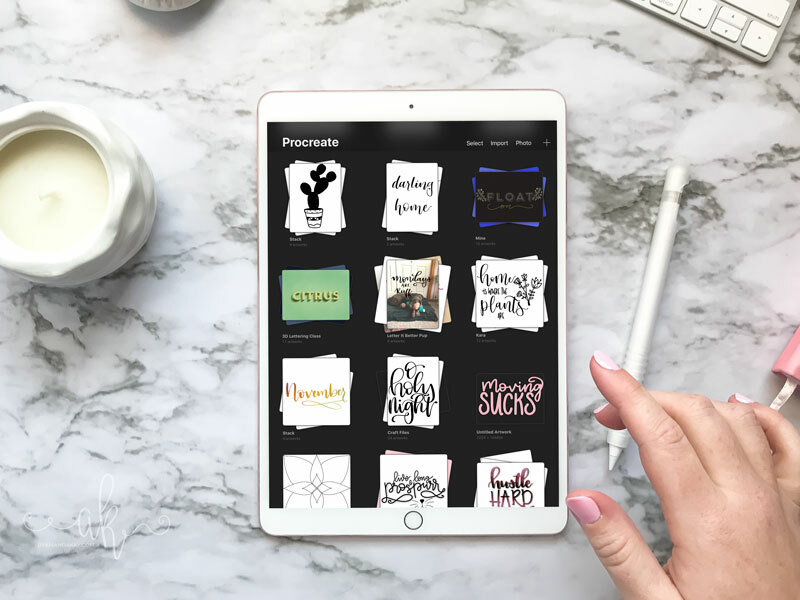 Periodically these freebies will include some pretty cool Procreate brushes, along side the already fabulous free fonts, graphics and photos. 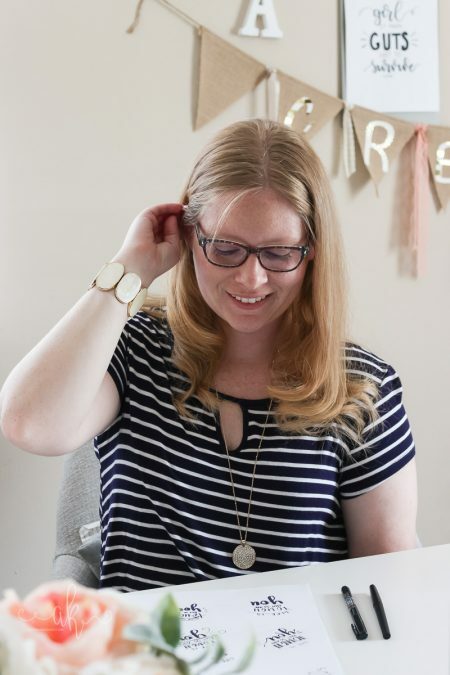 This is a free brush you can snag by signing up for her email list. You’ll also get access to her freebie vault which is amazing! I love getting Holly’s emails and seeing all of her cute doodles. Her YouTube is pretty amazing too! That’s right! 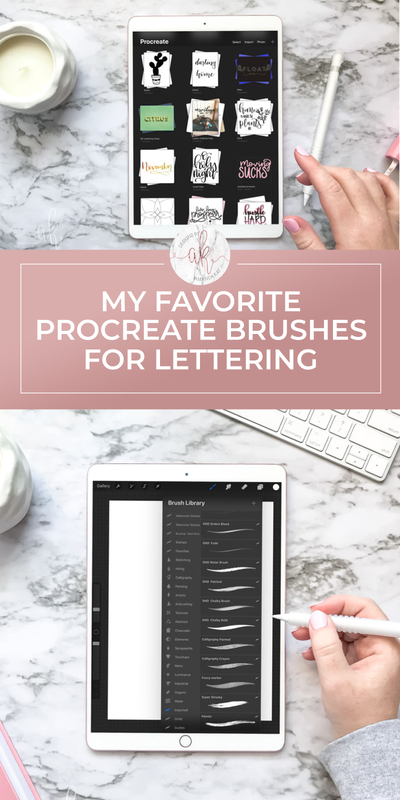 I have my own brush that I use for most of my brush lettering calligraphy within Procreate. It’s mocked after a regular brush tip pen with pressure sensitivity. This is also the brush that I use to make all of my free brush lettering practice sheets with. I love this brush so much that I’ve decided to offer it up to my email subscribers for FREE. You’ll not only get my brush for free, but you’ll get access to the rest of the subscriber only library. Sign up below! 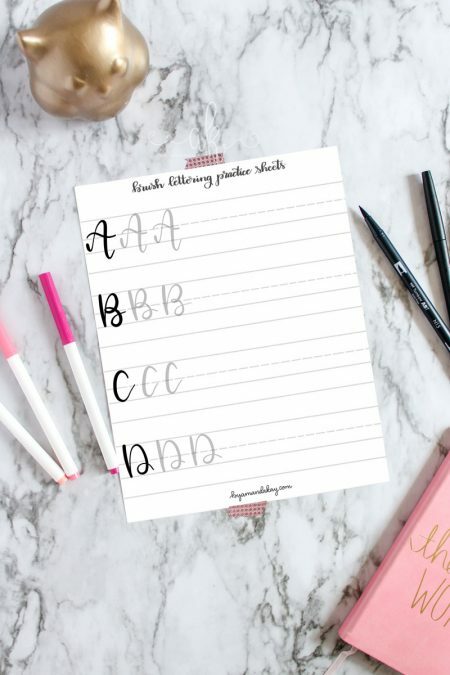 I have personally bought all of the brushes listed below and use them in my lettering on a regular basis. These Procreate brushes are the first set I bought when I first started using Procreate for lettering. I use the mono weight brush all the time, especially for details! Since I loved the DND lettering pack so much, I promptly decided to buy this pack of Procreate brushes from Dawn Nicole as well. I use the monoline detail brush alot, and love the calligraphy crayon brush. The texture adds such a fun detail! The stamp brushes are also great to add a little bit of flair to a piece quickly. You can see why this pack is named Colorado! Holly makes amazing brushes and these are some of my favorites to use! Loveland and Aspen are two of my favorite to use and Vail can add some fun detail to your lettering pieces. 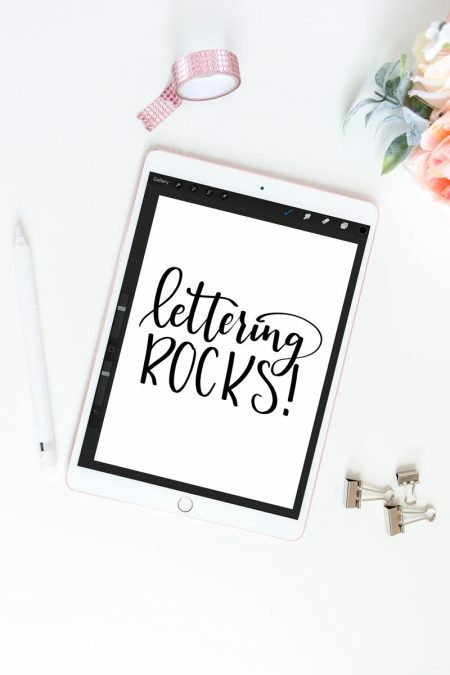 I love using the Letter Builder brushes to help with block lettering! The guides give me the ability to keep my lettering uniform and even in size. It comes with Thin, Thin Italic, Regular, Italic, Bold and Bold Italic. 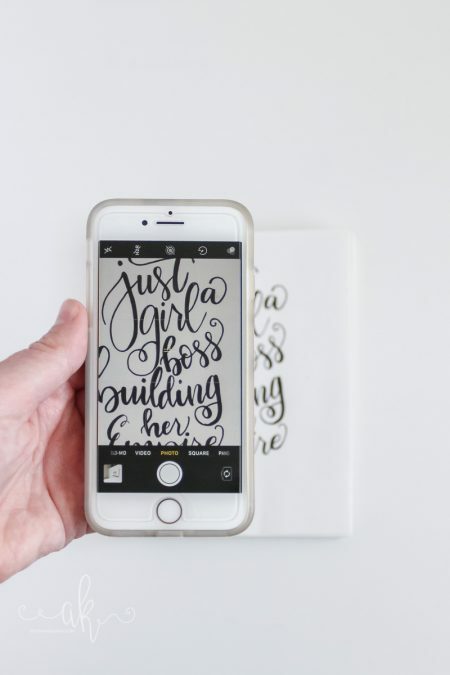 The Grid Builder guides are so fun to use for bigger lettering layouts! Play around with the layout just by selecting the brush and plopping it into your piece. 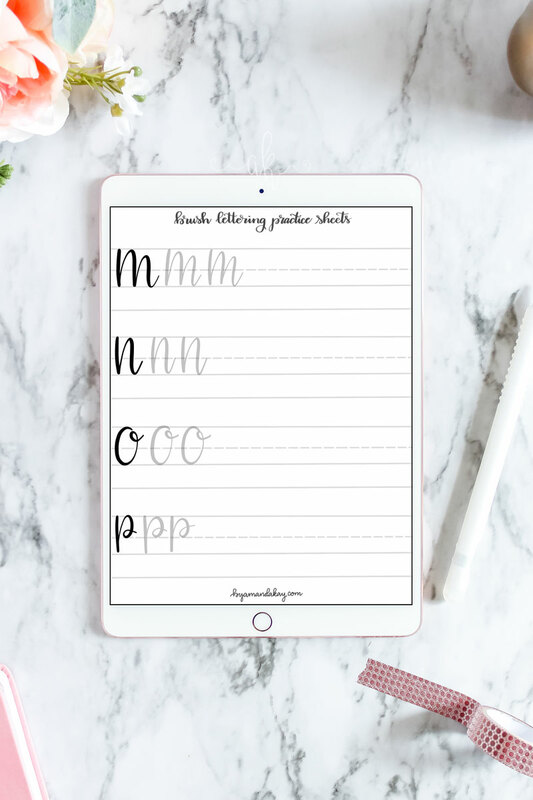 They are easy to use and move around to give you the most control over your lettering layouts!